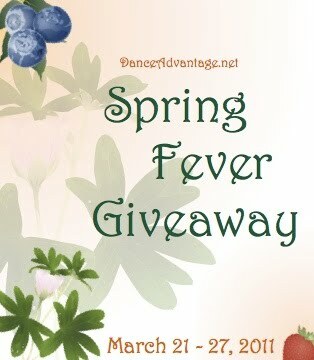 Seems it is that time again and we are super excited to share another week of giveaways provided by Dance Advantage. The last set of giveaways was lots of fun and we were lucky enough to win the Cynthia King ballet slippers! You can read all about it bellow(info taken directly from DA's post) or simply go to Dance Advantage now! Oh no you don’t. We like to surprise you! I CAN share that we’ve got you covered – your A-B-C’s and 1-2-3′s! Wearables, gear to help you practice and improve, teaching and curriculum aids, and more! All you have to do is show up and comment. Stay tuned all week to DanceAdvantage.net. There will be a link to the giveaways on the home page. Or bookmark this post. I’ll update it to include links to the daily giveway. It depends. There will be up to three winners on each giveaway. Winners will be chosen randomly from those that comment on each individual giveaway. Subscriber PLUS members will have the opportunity to earn extra entries. Good news! There’s still time to sign up… Join HERE. Why do you hold giveaways? I see it as a way to show appreciation to readers as well as highlight interesting companies and products with which you may not be familiar. And it doesn’t hurt Dance Advantage, either! It brings new readers and sponsors, creates a bit of buzz, and gives us a warm, fuzzy feeling. After I randomly draw your winning entry comment, I’ll contact you via email. You’ll only have 48 hours to get back to me. I’ve got to put a limit on it or it drags on and on and on…. So stay close to your email throughout the coming week (and a half). When I don’t hear back from a winner, I move on to the next drawn winner which makes another person happy (yay!) but another one pretty disappointed. I’d rather that no one is disappointed! Share, like, link on Facebook.